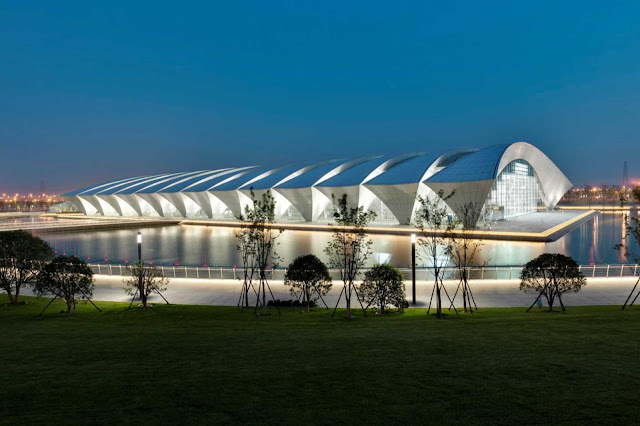 The Shanghai Oriental Sports Center (SOSC) was built on industrial brownfield land along the Huangpu River as a venue for the 14th FINA World Swimming Championships in 2011. It consists of a swimming stadium, a sports stadium, an outdoor swimming pool for outdoor high-diving competitions, and a media center. 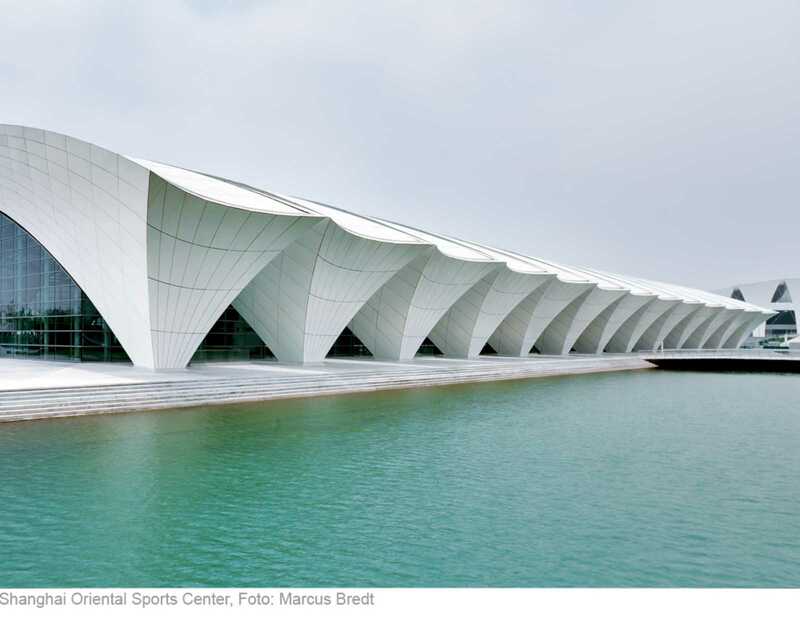 Recurrent design motifs — water and waves, beaches and bridges — in both the park and the architecture of the stadiums and media center reflect the overall theme of water. Water is the linking element between the buildings as well, which stand on raised platforms and stick out into an artificial lake. 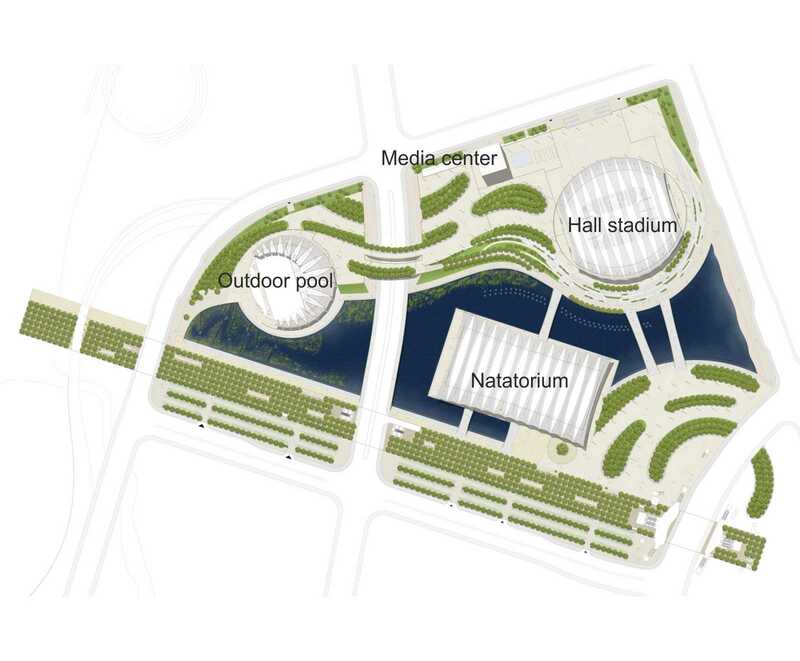 On the north side, a softly curving shoreline runs round the round stadiums, while there is a straight edge for the Natatorium in the south. 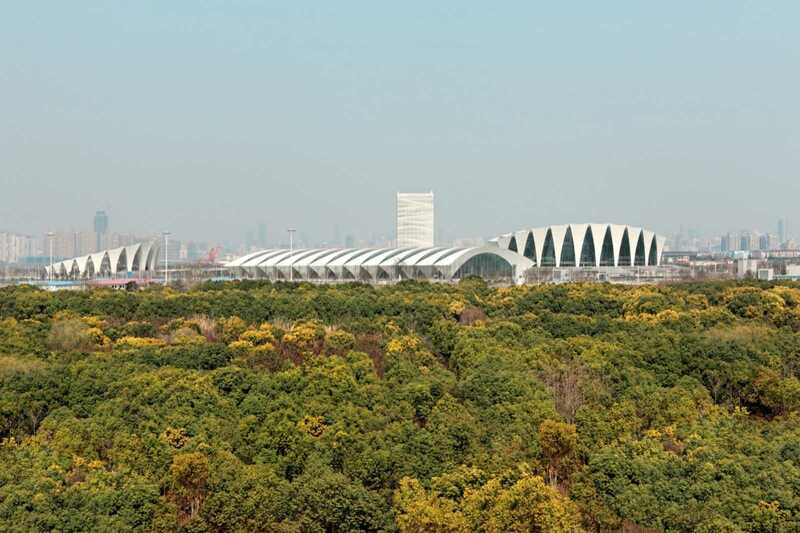 The links between the buildings are bridges. 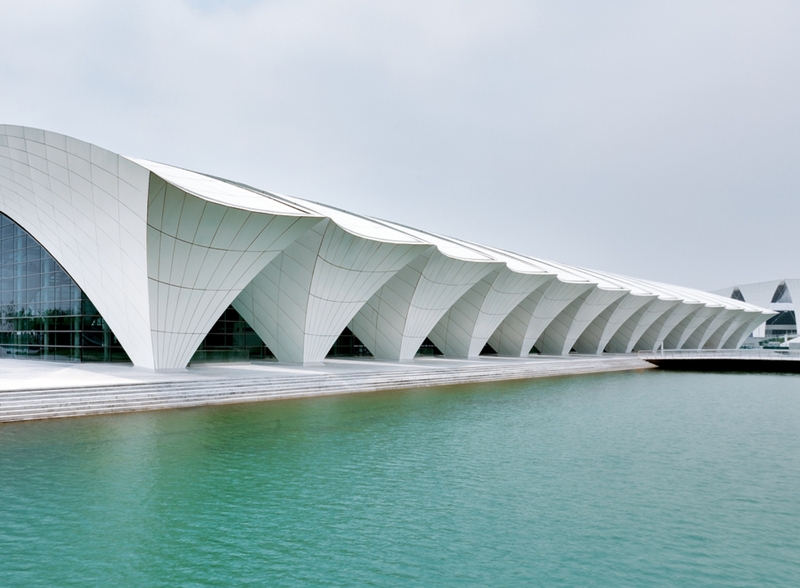 In this way, each building can be viewed across an expanse of water and is in an exposed position. 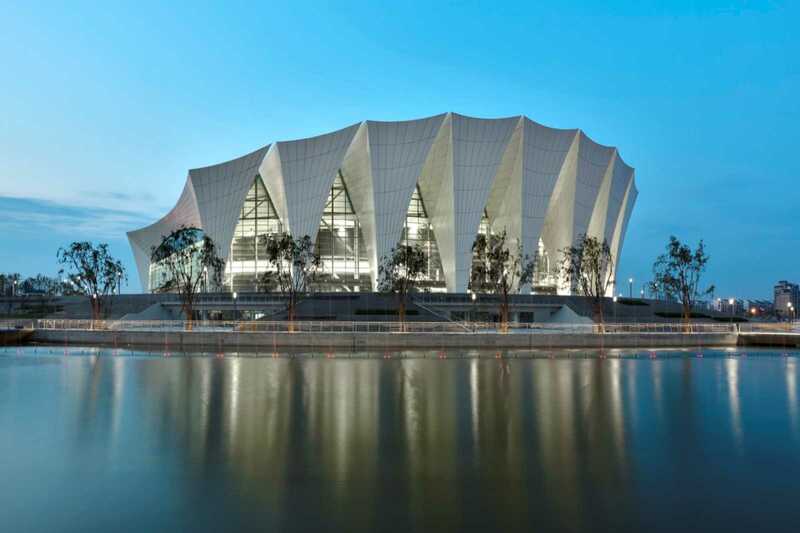 Design affinity, a common structural idiom and use of materials produce structural unity among all the stadiums. A steel structure of wide arches, with large-format triangular elements made of coated aluminium sheet forming the two-sided curved surfaces of identical radius along the frame of the understructure, evokes sails billowing in the wind. 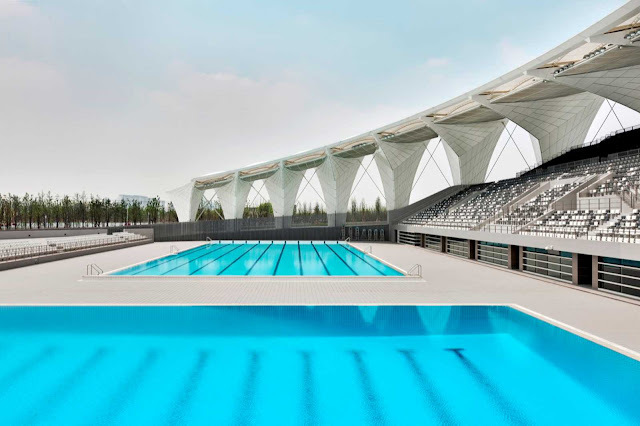 During the FINA World Swimming Championships, pool events and synchronized swimming championships will take place in the Hall Stadium, which later can be used for boxing matches, basketball, badminton or ice-hockey matches and concerts. The hall has a crowd-capacity of 14,000, which can be increased to 18,000 by the use of mobile seating. 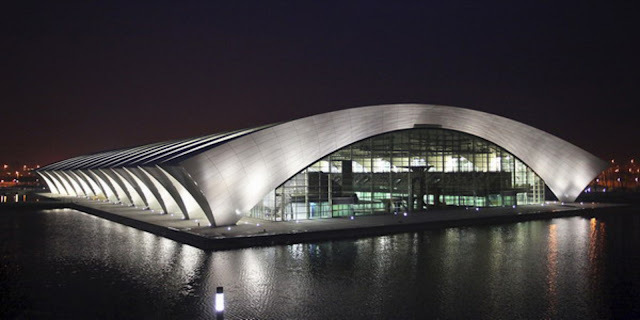 The main structure of the closed building with a round ground plan consists of reinforced concrete, while the roof is a steel structure with a 170m span with aluminium cladding. 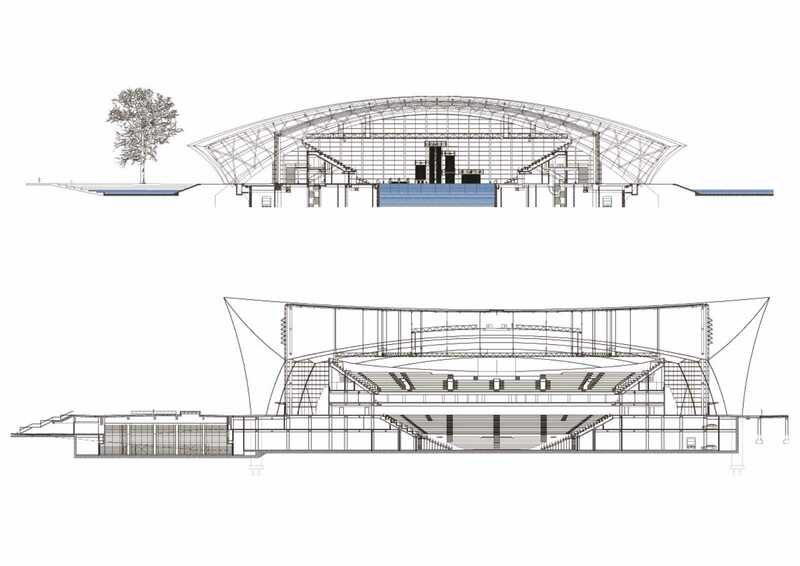 The parallel steel girders create 35m-high arcades and include the glass façades of the encircling open foyer. 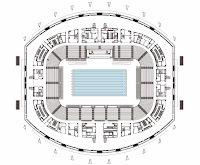 The Natatorium contains four pools arrayed in a row: two standard-sized, one for diving and a leisure pool. 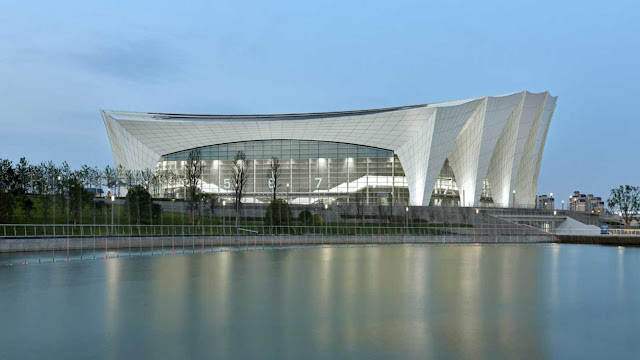 It has over 3,500 fixed seats, which will be expanded to 5,000 for the world championships, to meet FINA requirements. The swimming hall is a closed building with a rectangular ground plan, a main structure of reinforced concrete and a roof structure of sectional steel girders. The roof structure with triangular glass surfaces is around 210m long, 120m wide and 22m high. Direct, intrusive sunlight is forestalled by means of narrow toplights along the beams, without preventing natural daylighting. This swimming complex is located in the open on an artificial island and offers 2,000 fixed stadium seats. 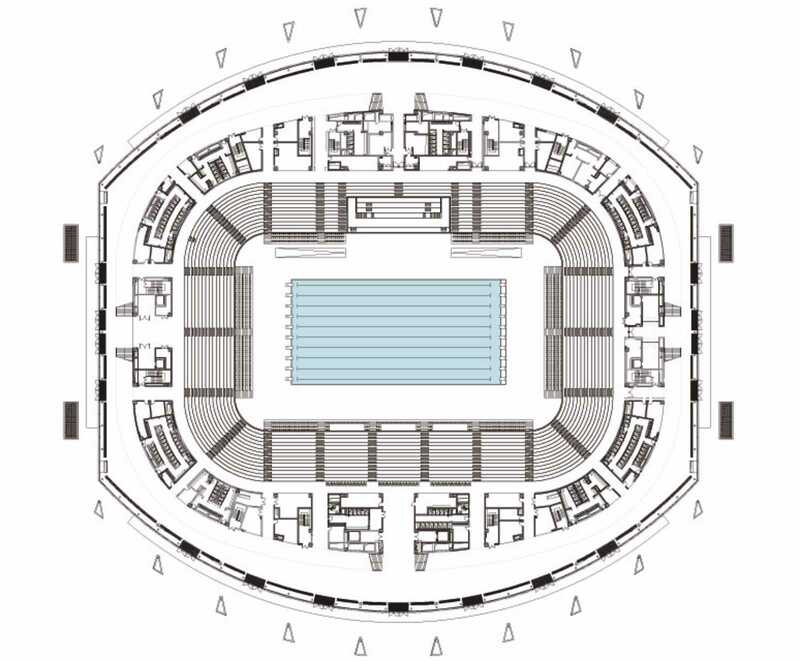 For the World Swimming Championships and other outstanding events, capacity will be increased to 5,000 seats. The competition-size diving pool and diving towers are complemented by a competition pool. As in the other stadiums, the roof structure with its external diameter of c. 130m reflects the round ground-plan of the shell of the building. The inner diameter is around 90m. The roof trusses are carried by the building structure. A lightweight membrane between the modules provides protection against sun and rain. 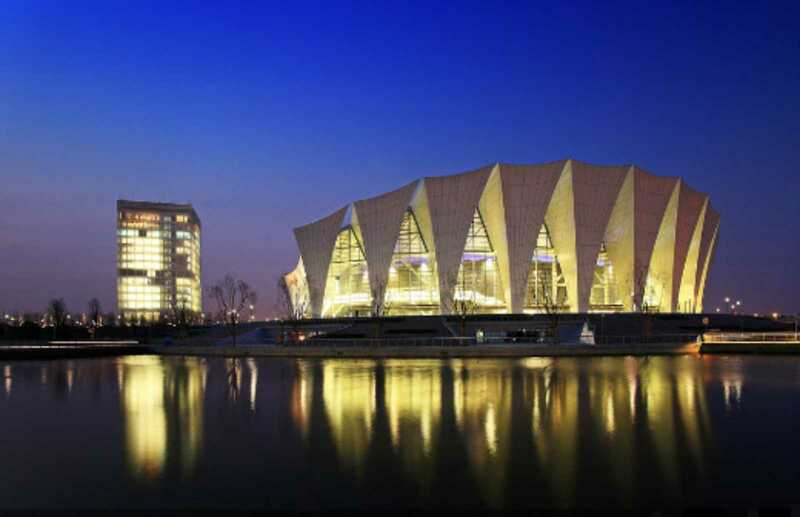 The 80m high high-rise building is on the northern side of the sports complex. 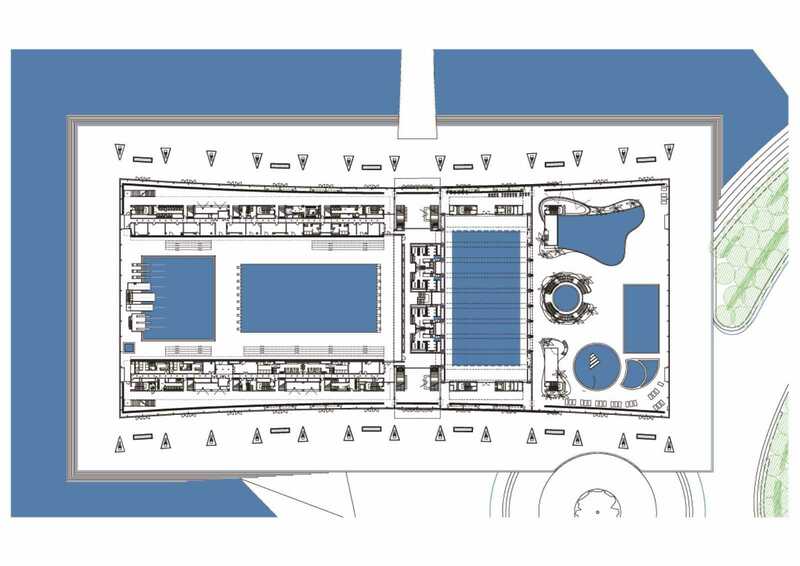 Its 15 floors include a fitness centre, conference rooms and medical care centre, plus VIP and office areas. 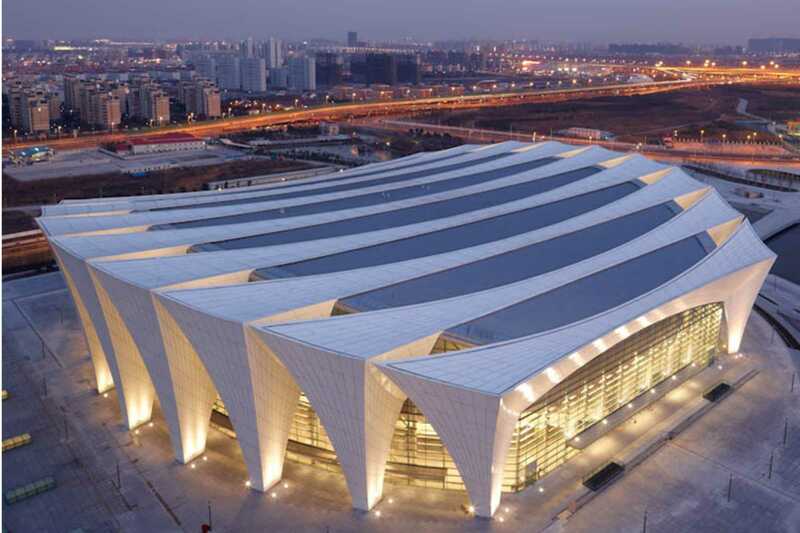 Because of the even 8.4m grid, the building can be used flexibly. 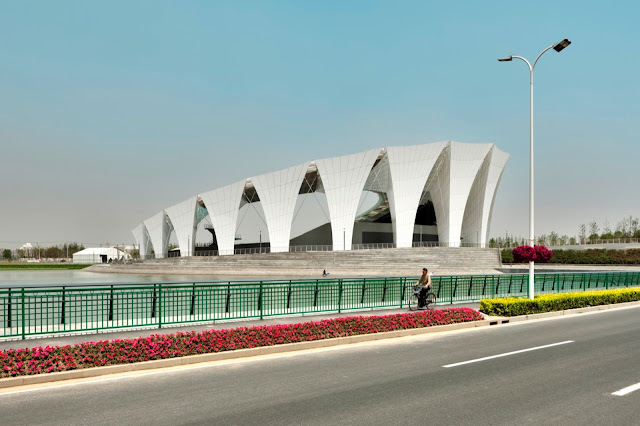 With its external shell of white, perforated aluminium panels, the building interprets the undulating shape of the adjacent lake.